A tree surgeon said to have falsely blamed his 14-year-old son for a doorstep murder has told a jury the shooting was an "accident". Matthew Moseley, 50, is alleged to have gunned down Lee Holt, 32, with a Beretta semi-automatic shotgun which he is then said to have handed to son Thomas, 14, and told him to make a fake confession to police. Giving evidence on Monday, the defendant said he never asked his son "to do anything" following the shooting outside his family home near Accrington, Lancashire, on October 25 last year. 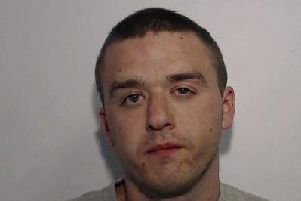 Preston Crown Court has heard Mr Holt went to the address in Barnard Close, Oswaldtwistle, with his partner, Kate Phelan and her 15-year-old son, Wesley Metcalfe, to confront Thomas over an ongoing dispute between the schoolboys. After windows were banged and the front door of the Moseley home was kicked, Thomas Moseley says he saw his father bend down by his gun cabinet, load a shotgun and then shoot Mr Holt as the front door opened. Matthew Moseley denies loading the gun or holding it as the door opened. He said: "There was a biggish bloke, shaved head, stood there. Coming out with a few profanities. He was on one, aggressive. Not very pleasant. "He looked at me, starting going towards the house and lifted his hands up. "Next thing I know, Thomas is at the side of me. I saw it (the gun) coming past. I put my hand up to knock it away and the gun went off. "I was not aiming it at anybody and it just went off." His barrister, Nicholas Johnson QC, asked the defendant whether he had leaned on his son from an early stage to take the blame for the shooting. Matthew Moseley replied: "I have never asked Thomas to do anything." Mr Johnson went on: "Had you had some sort of pep talk before the police arrived to encourage him falsely to admit shooting Lee Holt?" Mr Johnson asked Matthew Moseley whether he had decided to tell the police everything he knew when he gave a statement on the night of the murder. He replied: "I didn't tell them everything I knew because Thomas is my son." The jury has heard that when interviewed the defendant initially told detectives he only heard a bang and saw nothing before he later conceded his son "probably" discharged the firearm. His son was arrested after he told police at the scene that he had shot Mr Holt but during the course of his interviews he changed his account and said his father was responsible. A covert recording of the father and son as they were taken to court to ask for more time to question them was taken in which the Crown say the defendant was again pressurising his son to falsely claim responsibility. Mr Johnson told the jury that at one point the defendant is heard to say: "At the end of the day, Thomas, they have come down the drive. They were going to kill you ... it was just a freak accident. You did what you did." Asked what he was referring to, the defendant said: "He defended himself basically." In the same recorded conversation, Matthew Moseley later says: "Come here, I will sort it. If I have to take the blame then they will let you out tonight." Mr Johnson asked him: "What did you mean?" The defendant said: "He did not deserve to be there because he has put up with enough ... bullying. He defended himself. It was an accident." Mr Holt was taken to hospital but died hours later from a single gunshot wound to the chest.